Rubber is vital to a modern industrial economy. It is used in tires for motor vehicles, as insulation in electrical systems, as waterproofing, and in countless other ways. 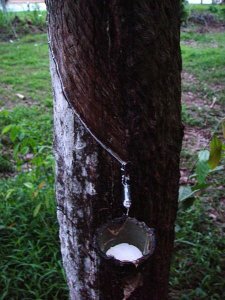 Natural rubber is derived from the latex of the rubber tree Hevea brasiliensis. The raw rubber is ground, dissolved in solvents, and mixed with various other ingredients such as fillers or pigments. Rubber tires contain carbon black to prevent the buildup of static electricity, which shortens the life of the tires, interferes with vehicle radios, and poses a fire risk during refueling. Rubber trees are large (60 feet) deciduous trees, losing their leaves during the dry season. They take seven years to reach maturity, after which they yield for about 25 years. The trees can be propagated from seed but are normally cloned from high-yield varieties. Rubber trees are ideally suited to cultivation in humid tropical monsoon climates and thrive in the lateritic soils characteristic of tropical rain forests. Rubber was the only bulk industrial commodity more readily available to Japan than the United States before the war. The rubber tree originated in Brazil, but the British smuggled seeds to Ceylon and began establishing plantations there and in Malaya. By 1941, over three million acres were under cultivation for rubber production. Large plantations also existed in the Netherlands East Indies by 1941. These plantations largely drove Brazil out of the world market. With the capture of these areas in early 1942, the Japanese secured ample rubber for their needs. At the same time, they denied natural rubber to the Allies. The seizure of the rubber plantations by Japan was entirely foreseeable, yet during 1940 and 1941, a time when the United States government was urging private industry to begin retooling for defense production, rubber was oddly neglected. Instead, private industry was left to take the initiative. Some effort was made to revive the Brazilian rubber industry, but with a seven-year period for a rubber tree to come into production, this gave little hope. The Allies turned their efforts instead towards the manufacture of synthetic rubber from petrochemicals. DuPont had developed neoprene in 1931; while this had many applications, it was not suitable for rubber tires. Thiokol and B.F. Goodrich introduced their own products under much fanfare, but these made little impact. Meanwhile Jersey Standard prepared to manufacture Buna, an invention of the German I.G. Farben firm, under license. Ironically, Jersey Standard had attracted considerably public criticism for its ties to I.G. Farben, but the company would take the lead in synthetic rubber for the U.S. defense buildup. Buna came in two varieties, Buna-N and Buna-S. Buna-N or nitrile rubber is a polymer of acrylonitrile with butadiene. It is strong and highly resistant to oils, organic solvents, and other chemical agents, but lacks flexibility. Its resistance to chemicals gave it a viable commercial market in 1940, but, like neoprene, it was not suitable for tire manufacture. Buna-S is a polymer of styrene and butadiene that makes excellent tires, lasting 20% to 30% longer than natural rubber tires, but in 1940 it was four times as expensive as natural rubber. Jersey Standard completed a plant for manufacturing Buna-N by the end of 1940 and also began work on an experimental plant to manufacture the key ingredient, butadiene, from petroleum. The company also offered licensing rights to Buna-N to any other company that was willing to experiment with Buna-S. Firestone began manufacturing Buna-S in February 1940 and began work on a $50 million plant for mass production. The synthetic rubber program then stalled, in part because of the Clayton Memorandum of 20 February 1941 which made the completely unrealistic claim that U.S. reserves would last for at least three years in wartime. The tire manufacturers pressed their case, and the Office of Production Management finally awoke to the need. A government that was previously reluctant to consider a $30 million pilot program in 1940 approved a $700 million program in early 1942. U.S. Rubber had broken ground for the first of four pilot plants subsidized by OPM in September 1941, but a great deal of time had been lost. In spite of efforts to build up a strategic reserve, the United States had stockpiles of just 533,000 tons of rubber in 1941, barely a year's peacetime consumption, and it was some time before the new synthetic plants were running at full production. The resulting severe rubber shortage led to rationing of gasoline throughout the United States in order to save automobile tires. Existing tire stocks were made available only to the military and for critical civilian needs. An effort to collect a million tons of scrap rubber in 1942 was unsuccessful, yielding only 335,000 tons of scrap rubber, much of it useless for manufacturing tires. The United States negotiated the purchase of the limited South American production in July 1942, but this was far short of requirements. Politics continued to plague the synthetic rubber program through the summer of 1942. Butadiene could be produced from both petroleum and from alcohol produced from corn, although corn-based rubber cost 25 cents per pound versus 15 cents per pound from petroleum. Agricultural interests pushed for government funding for corn alcohol anyway, arguing that the rubber shortage was a serious enough emergency that every production avenue should be developed. Between March and June 1942, the government contracted for 526,200 tons of butadiene from petroleum, 80,000 tons from alcohol (all produced from petroleum), and 40,000 tons from benzene. Under Senate pressure, the alcohol fraction was increased to 220,000 tons, and a bill was passed establishing a top-priority agency to oversee production of butadiene from agricultural commodities. Nelson, head of OPM, described this as "probably the most unwise and unwarranted piece of legislation passed by Congress during the war" (quoted in Klein 2013) and Roosevelt vetoed the bill. Fortunately for the Allied cause, the synthetic rubber effort was ultimately successful. Roosevelt put Bernard Baruch, who had directed industrial mobilization during the First World War, in charge of a committee to evaluate the synthetic rubber program, and Baruch consulted scientists and engineers who told him that oil was the best source of butadiene. The tough president of Union Pacific Railroad, William Jeffers, was put in charge of the program and proved adept at sweeping aside bureaucratic obstacles. The invention of very high temperature fluid catalytic cracking in early 1942 multiplied the yield of butylene, a feedstock for butadiene production. Though production of synthetic rubber was just 22,434 tons in 1942, by 1943 the United States had fifteen production plants in operation and production was 231,722 tons. In 1944, the figure increased to 753,111 tons, and the government had 51 synthetic rubber plants in operation by the time the war ended. However, replacement tires remained unavailable for nonessential civilian drivers until nearly the end of the war.